Medan Gotland Art week goes Japanese pågår den 20-24 aug kan du vinna ett japanskt kortspel! Utmaning: Kom och spela mot oss. Om du vinner 2 gånger i rad, får du ett spel! Här kommer de 12 diktcitat som vi spelar med i denna utmaning. En läsare kommer att läsa hela citatet på ett läskort (första bilden). Ett spelkorten innehåller andra delen av citatet (andra bilden). Det gäller att vara snabbast med att ta det rätta spelkortet. PS: Om du kan andra delen av alla 12 diktcitat utantill vinner du också ett spel! 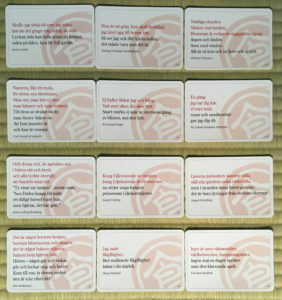 *) Max ett spel per person. Vi har 5 spel att vinna varje dag. 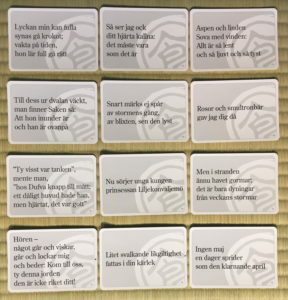 Välkommen till Ogoola Karuta blogg. Ogoola Karuta blog is about the process of making the game and also about the contents of the game. 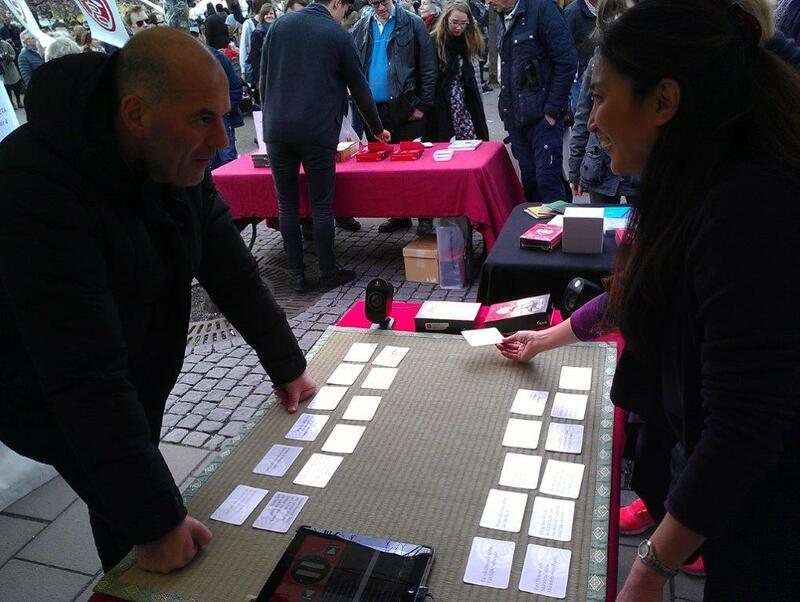 We write about our experiences in playing the game together with friends and people we introduced the game to. We would like to share our thoughts and experiences we have through this game together with you. 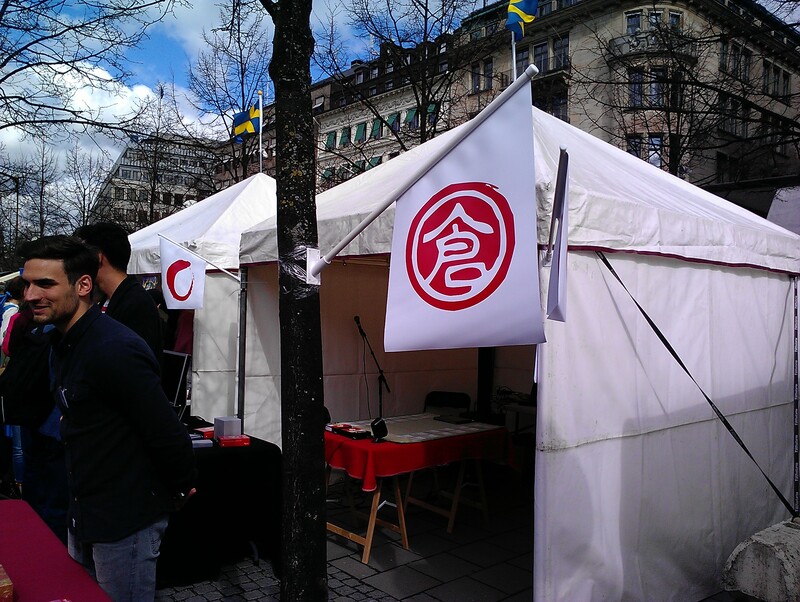 There has never been so many visitors to this Japanese Festival in Stockholm. The people’s interest in Japanese culture has grown and I find it fascinating that a small country like Japan attracts people from all over the world. What is so interesting about Japanese culture? They do have odd things and the Japanese tend to become geeks in what they do and like. Their nature is going fully into things and doing things. In a good sense, they create specialists and masters out of pure interest and passion. Playing ”Karuta” is one of those typical Japanese attitudes. 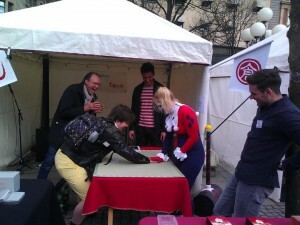 How could people become so engaged in playing cards? And this is not for money! It is pure love and passion. 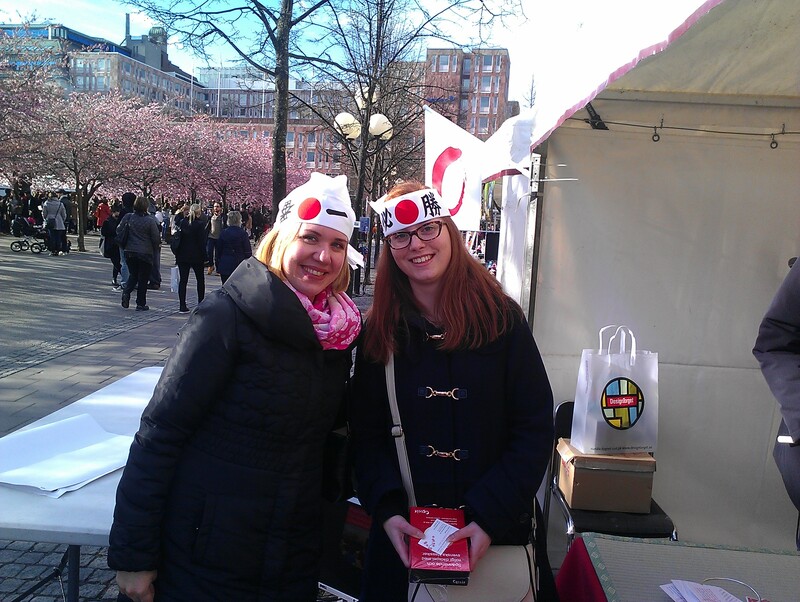 We decided to introduce our world’s first ”English” karuta at this Japanese (Cherry blossom = Sakura) festival in Stockholm this year. 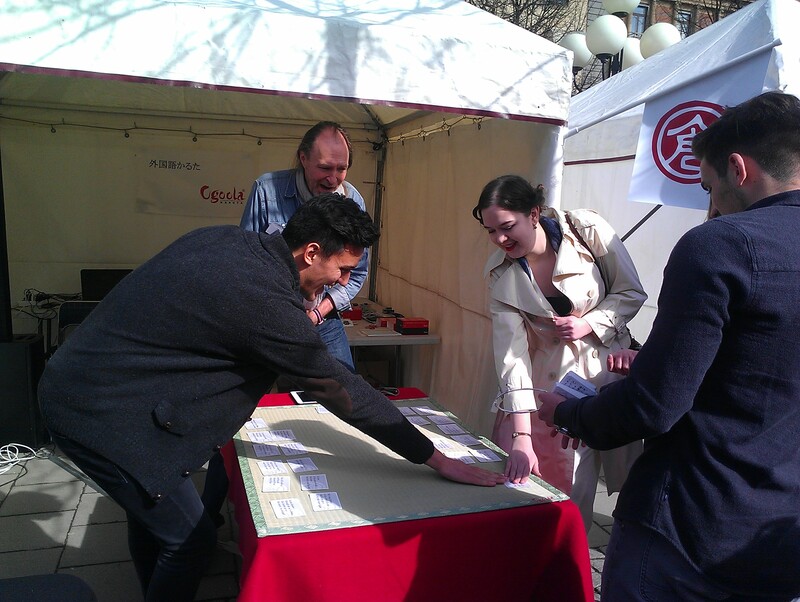 Many many people tried the game and it was so much fun. Everyone says that you just have to try it. Although it is very easy to play, the rules seem complicated at first. We really had an exciting day with tons of people playing at our booth. 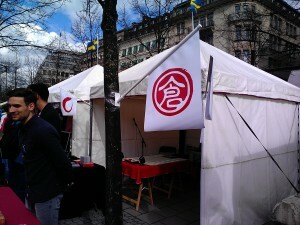 I will post some pictures from the event. It was Thursday evening’s ”boardgame night” again at Skuggspel in Visby. Normally there are about 10-15 people going in and out on Thursdays from 17:00 but today there were only 5 people and one left around 18:00. So I thought this week there will be no boardgame night. I was kind of ready to leave but instead of leaving, I took out my Ogoola Karuta games from my bag and layed them on the table. Then suddenly a young man named Marc who is studying games at the university in Visby (to become a programmer ) suddently wanted to try the ”Ogoola Karuta”! I had both the English and the Swedish karutas with me so I asked him ”Which one do you want to play? The English karuta or the Swedish?” Then to my surprise, he wanted to play the English karuta! Just when I was about to start to play with Marc, Magnus (a boardgame lover who is working on Gotland) came in and asked if he could also play, so I was happy to give him my place and become the game master! It was so fun to watch them fight to win! They were playing karuta almost as wild as the Japanese, kyogi karuta geeks. It was exciting for both the players and the watchers. So another young man popped up to play. This man is Taurus. Taurus then played with Marc, then invited or even insisted that Simon (another young student at the game department) play against him. Simon was veeery very skeptic about the game. He thought that this would be a boring game. But to our surprise and also to his surprise, the game was extremely exciting and fun! I couldn’t believe what I was seeing. The intensity and focus. It was like when the kids at Atheneskolan were screaming when they played the game. Simon said that he could not imagine that this game would be fun until he played it himself. He was really surprised. Simon also said that what he thought would be the most boring part of the game, for example to try to analyse the meaning of the poem so that he could find the matching poem, or listen to the rhymes to find the matching poem was actually the coolest part. And that really surprised him- he said. I could see that he really meant it and that really made my day. The young men at Skuggspel really helped me see that I am doing this because it makes me really happy to see people enjoy playing the game- having a great time, laughing and screaming. It really gives me joy to my whole existence. Yes! We played Ogoola Karuta at a game shop in Visby last Thursday. The game shop is called Skuggspel. A small boutique that sells games and they have some space for customers to hang out and play games there. A kind of game café. Really cool. We’ve played Ogoola Karuta with friends and our familiy and at schools. But this was the first time we played it in a game shop. Because people who come there are ofcourse game lovers and they immediately understood how to play the game strategically we were very much inspired of how to play the game even more dynamic. The game experts go one step further than the people who are not used to playing games regularly and we could learn a lot from them. The interesting thing about games is that you get to know a part of the person you play against in a natural setting. We hope to build up a karuta club at this game store so that more people can get to know this game. Come join us and play! I will be there on Thursdays from 17:00. It’s board game night every Thursday at Skuggspel in Visby.